Following a devastating tornado in Joplin, M.O., that killed at least 89 people, residents found phone lines destroyed or choked with traffic. But text messages and social media weathered the storm. One of the worst tornadoes in America history tore through Joplin, Missouri on Sunday night, killing at least 89 people and destroying at least a quarter of the town–an exact count of the devastation was impossible due to the disruption to local infrastructure. Joplin is a mid-sized community of approximately 50,000 people. And for a variety of reasons, the tornado ended up being documented by social media much more extensively than by national news television networks. Much like another recent news story that broke on a Sunday night–the death of Osama Bin Laden–and like the successful ditching of US Airways Flight 1549 in the Hudson River in 2009, amateur journalists quickly disseminated and constructed a narrative on the spot. Twitter users found the service awash in a stream of requests for aid and prayers that were interspersed with photos and on the spot reports. The same phenomenon also occurred on YouTube and Facebook. While the networks rushed from the big cities and Joplin’s local news media found themselves overstretched, local would-be journalists stepped into the lurch. Post-tornado streetscene in Joplin, MO. Image via Twitter user @disguisedasshy. On social networking sites, people with ties to Joplin and even those without were calling for prayers for the city. Some people were quick to post that they and their families are OK, or to get the word out that loved ones are missing or homes were destroyed. Others found themselves without access to phones because of overburdened phone lines, but able to text and use social media. Users on Twitter quickly uploaded devastating pictures of the impact to Twitpic and other services. For just one example, a Kansas-based Twitter user named @parismyloveff uploaded pictures of the ruins of what used to be a local Home Depot and a Payless ShoeSource where two women disappeared. 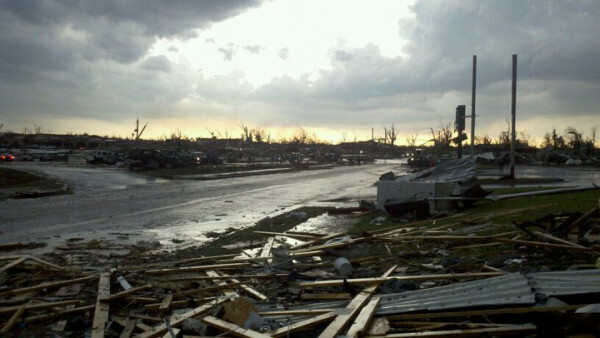 Remains of Joplin, M.O. Payless ShoeSource. Image via Twitter user @parismyloveff. Flickr also became a popular site for pictures taken on the ground post-tornado. 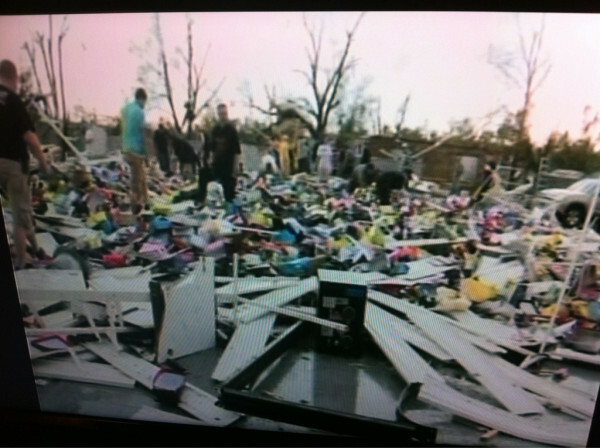 Others turned to YouTube to upload footage of tornado devastation as it happened. One brave soul, puzzlingly, went outside to film the tornado from his patio. 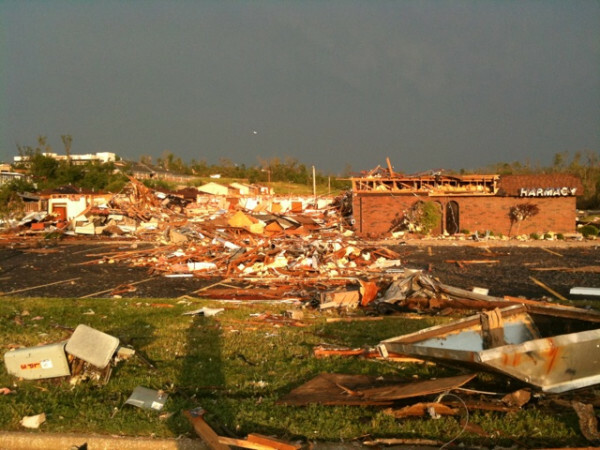 Meanwhile, residents of Joplin turned to YouTube to make home videos of their neighborhoods being destroyed. In one heartbreaking clip, a Joplin resident explored the ruins of the city’s primary hospital, which was destroyed in mere minutes. The Missouri Department of Health and Senior Services is currently allowing health professionals to volunteer for service in storm devastated-areas.